Strop was worried. “There’s never anyone in there anymore. 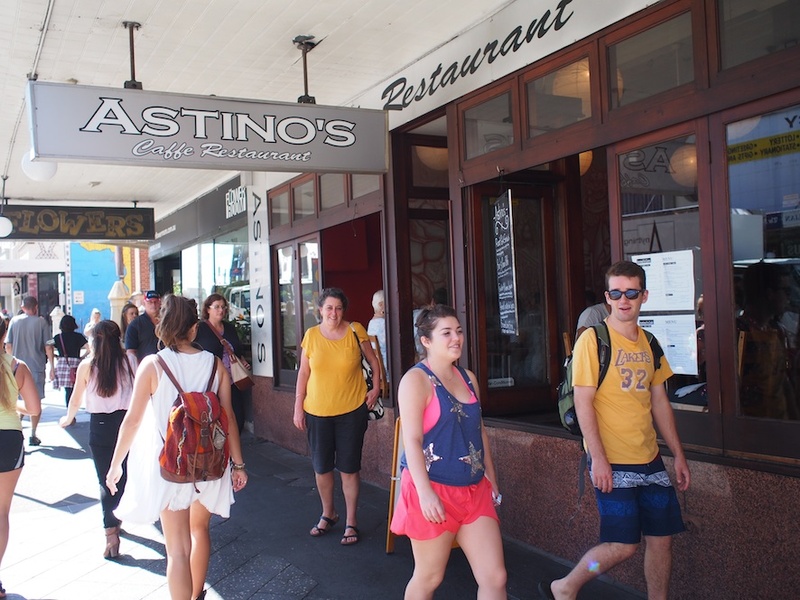 It used to be popular, but now its nearly always empty.” She was right, for a long time now Astino’s has looked pretty empty whenever we’ve ambled past. 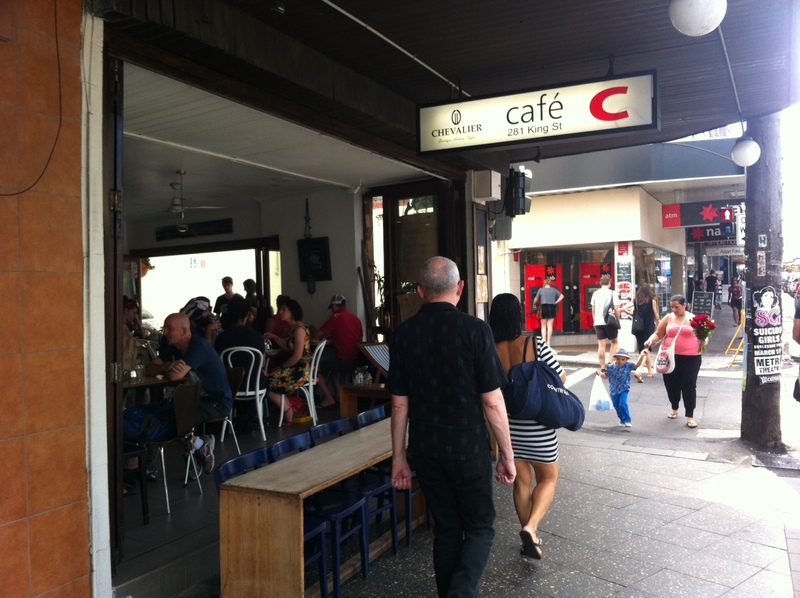 It’s a cafe with a big room and large windows onto King Street, so it takes quite a few punters to make it look busy. When we first moved to the area it seemed to be popular, but not anymore. So we arrived for breakfast without particularly high expectations. Our first surprise was that there were no tables outside. In my memory Astino’s always has tables outside, full of people sipping coffee and trying to converse over the noise of the traffic. Not today. But there is a blackboard outside. Specials. Smashed avacado on bruschetta. Poached eggs with stuffed hashbrowns(? ), bacon and eggs on brioche. What’s going on? We were expecting bog ordinary brekkies again. All of the customers are occupying the tables lining the windows onto the street, leaving the rest of the big room empty. Strop and I join this trend and squeeze onto a corner table at the front. It’s a beautiful sunny autumn morning, and King Street is its usual noisy, entertaining self. In light of the fact that Astino’s has menu items approaching the interesting on its shortish breakfast menu, I have decided to break the cafe suite rule and ignore whatever version of the big breakfast Astino’s do. Also, this is my second breakfast for the morning. 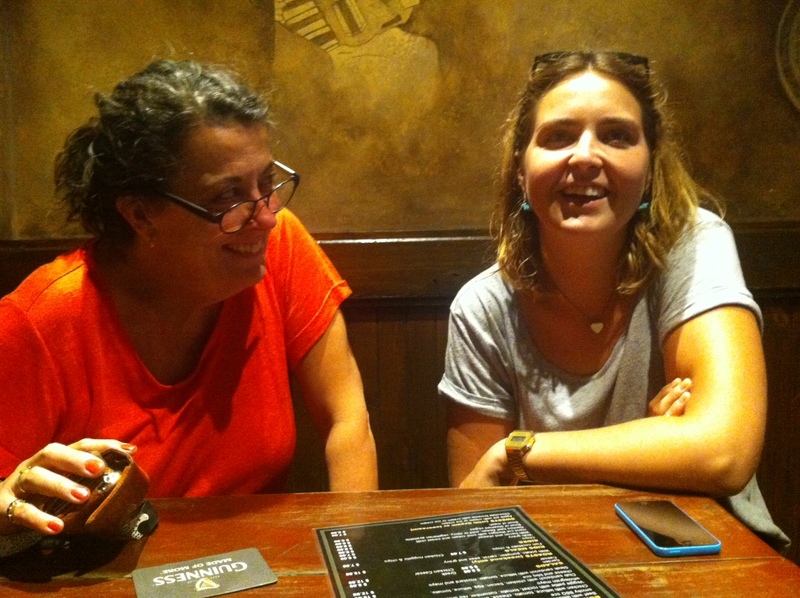 We start with a couple of coffees – which aren’t brilliant, it has to be said. Not awful but… this is Newtown, there is a lot of very good coffee around (although as we are finding, the best stuff is not actually on King Street). Our food arrives quickly which is good, and appropriate given that the place is not exactly heaving. Strop’s smashed avacado is a very tasty mix with lots of coriander and red onion. My bacon and egg on brioche is exactly that, with a generous (possibly too generous) dollop of very nice tomato relish. Yum. By the time we have finished our food it becomes obvious that our juices are not going to come without some prompting. The waitress is hand-over-mouth apologetic. “I forgot. I’m so sorry. Do you still want them?” Well, yes we do, that’s why we ordered them. They come quickly, with more apologies, and they are good. We are refreshed. We decide to forego a second coffee and leave on a orange-and-pineapple-juice-induced high note. While I go outside to try to take a photograph without looking too uncool, Strop pays, which is only fair. Strop has a habit that freaks me out: engaging people in conversation. She’ll talk to anyone and it worries the hell out of me. Luckily, I’m safely out on the street this time. While it is a risky habit she’s got, it does mean that she finds stuff out. This time she’s found out that Astino’s has just changed hands! And soon they will close for a week for a makeover!! We clap our hands with glee. Maybe new Astino’s will be wonderful. 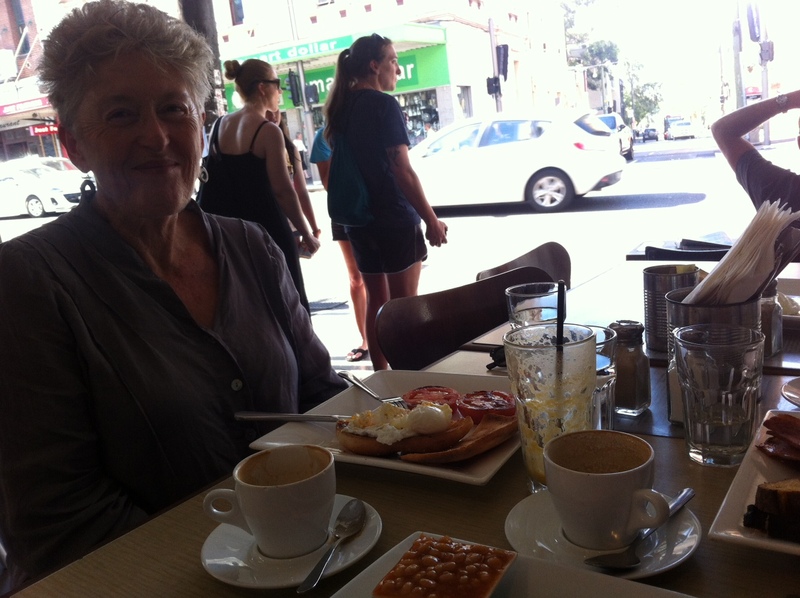 281 – Cafe C – Do you want commas with your eggs? We’re closing in on Newtown Station now which I’m arbitrarily declaring to be the nominative half-way point for the Quest. Unfortunately the powers that be are making things harder for us – the redevelopment of the station has spawned a bunch of new eateries for us to make our way through before we get there. Oh well – better get on with it then. This week it is Cafe C, which is an un-themed, run-of-the-mill cafe. It seems to be very popular and it has a great location, right at the end of Erskineville Road, and on the corner of Mary Street. This is a breakfast outing as the Cafe Suite of rules has been invoked. Our guest this morning is Anna, who has come all the way from Five Dock, and passed a lot of very acceptable breakfast venues along the way, so I hope Cafe C makes it worth her while. It is a lovely saturday morning so we sit near the front where we have a good view of the passing parade. Being near a pedestrian crossing gives you plenty of time to give the crowd a serious once over, and wonder at some of their life choices, not to mention their fashion sense. The downside of being near a busy intersection is the noise. 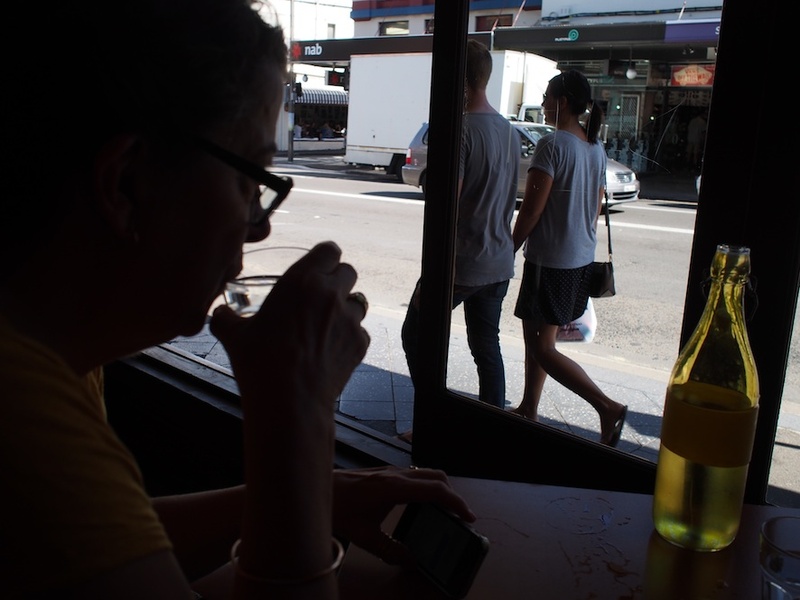 And being Newtown there is always some emergency going on nearby, with ambulance sirens and flashing lights punctuating the roar of semi-trailers and the squeal of bus fan belts. Despite the noise we have a lovely chat, while keeping an eye on the street in case we catch a glimpse of the legendary Goat Man of Newtown. What with the tattoo and body art expo having just been in town, I thought Anna may have been referring to body adornments: someone with horn embellishments or perhaps big floppy ears. But no, apparently she has seen (with her own eyes), a man leading a pair of goats along King Street. I want to believe, but nowadays I’m old enough to need proof. So please let me know if any of you lot have seen the fabled Goat Man of Newtown. The Cafe Suite rules call for one of us to order the ‘big’ or ‘full’ breakfast option – often named after the cafe. However in honour of the imminence of St Patricks day I decide to put a slight bend in the rule and veer away from the Cafe C Brekkie in favour of the Irish Breakfast. This comes with beans, sausage and black pudding, as well as the usual eggs, bacon and toast, so I think that it still qualifies as a big breakfast. Strop selects the fritters with a side of bacon while Anna plays it safe with poached eggs and toast. I have to say that I thought the breakfast menu was a bit boring. Lots of variations on the usual suspects, but nothing particularly adventurous or new. Or even interesting. 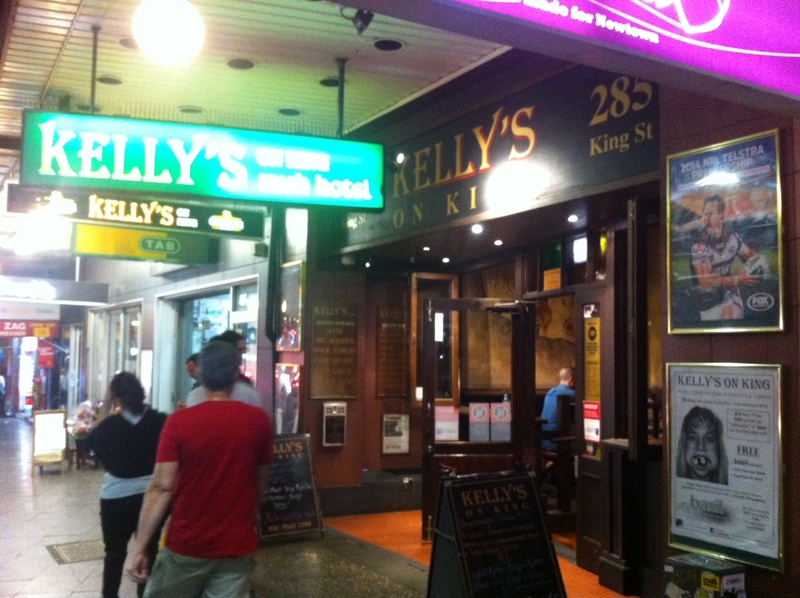 But then we are still officially in the King Street doldrums, so what else should I expect. All the interesting and innovative stuff seems to happens just off King Street. It must be something to do with the rental agreements. 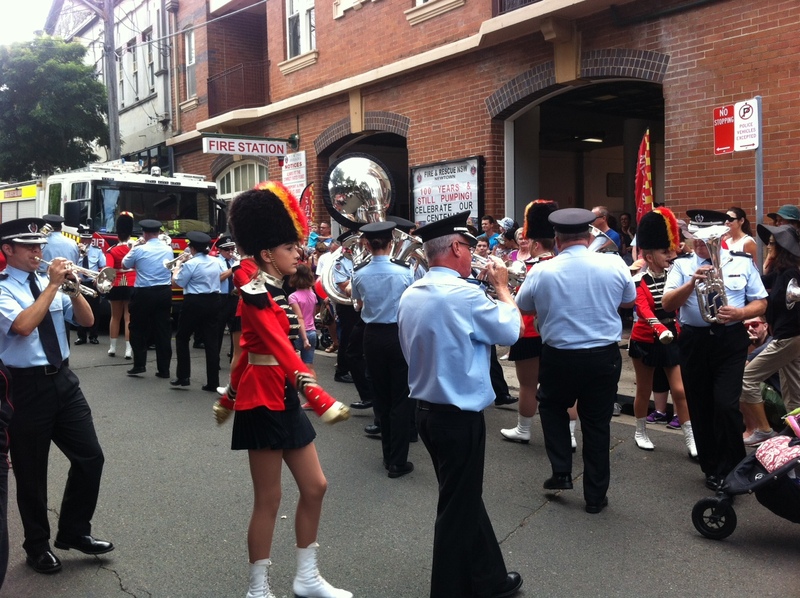 On the way home we bumped into the centenary celebrations for Newtown Fire Station. What are all these fire engines doing parked on the road, we thought at first. Then, ooh look, a brass band, we exclaimed. Who doesn’t love a brass band? That’s right: no one. “100 Years and Still Pumping” the banner said. Ha! After a three week hypothyroid-induced hiatus (thanks Strop, as always, love your work), that took me in a low orbit, skimming the outer atmosphere of planet Comatose, the drugs are starting to kick in again and I’m mostly back on deck. Unfortunately all we have to celebrate our return is Simply Noodles, so this will probably be a short report. Mainly because I made the mistake of reading up on defamation laws, the basic logic of which, seems to be: our defamation laws are harsh so that your food reviews aren’t. Oh well. I’ve never thought of myself as a food reviewer anyway, more of an urban-safari-ist. So that will have to be my defence. Simply Noodles. We saw it arrive, way back whenever that was, all modern, with shiny hard surfaces, promising, cheap, tasty Asian noodles served fast to the funky young pre-movie crowd. Sort of an Asian version of Italian Bowl, before that had even arrived. And for a while it lived up to the promise. Unfortunately, that changed. 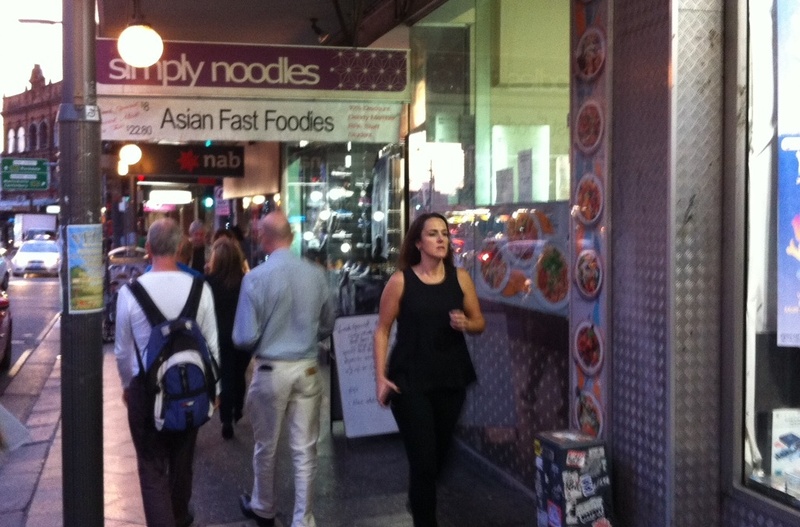 Simply Noodles is still there, though you have to wonder how as the crowds seem to have passed it by, and these days all the modern surfaces just highlight the lack of character. The night we went, there was one other customer who left soon after we arrived, a couple of takeaway customers, and some young women who came in soon after we did. It’s a one-man operation, run by a guy who bears a striking resemblance to Roy Orbison, if Roy had been Chinese. Though I suspect Roy might have been a better cook. You order at the counter and that is where your food arrives. Roy helpfully shouts at you to let you know it’s time to come and collect it. I decided on a Chicken Laksa and Strop chose Char Kway Teow which is offered as either curry flavour or soy. I’d like you to ponder that for a moment as we did. Curry flavour. Or soy flavour. We added a couple of beers to the order too. The way things were shaping up we were going to need them. When the Char Kway Teow arrived, Strop muttered something about a “flavour bypass” before returning to the condiment counter for more soy and chilli. As for the Laksa, I may have had worse, but I can’t remember when. I couldn’t taste much coconut, or anything much else apart from a bit of chilli. On the way out Strop didn’t give Asian Roy a smile or a thank you – I can’t remember her doing that before. She asked if I thought this was the worst place we had been to. It’s a good question.